The Congress party on Tuesday alleged that there are around 42 lakh duplicate entries in the published electoral roll for Rajasthan which goes to polls later this year. The party also claimed that there has been an 'abnormal' growth in the number of voters over the last five years, alleging that the integrity of the voter list has been meddled with. Party leaders from Rajasthan submitted a memorandum to the Election Commission, asking it to intervene and ensure preparation of a “sanitised” final list of voters. The Congress had earlier petitioned the EC over existence of a large number of fake voters in the electoral roll of Madhya Pradesh which will also have assembly elections at the end of 2018. The Congress, in its memorandum to the commission, has cited the analysis of the electoral roll, which comprises 4.75 crore voters, by the organisation ThePolitics.in. According to the findings of the analysis, submitted on an affidavit to the EC, there are 42.8 lakh duplicate IDs which have the same name, name of relative and gender. As many as 10.4 lakh duplicate entries exist with same age. And there are over 91,000 duplicate IDs with the same EPIC number as well. The party claimed that the growth in the number of voters is disproportionate to the growth in the population of the state. It said there has been around a three per cent increase in the number of voters every year in the last five years, which is improbable in the normal course. The number of voters has gone up by 70 lakh since 2014. “Existence of fake voters in the electoral roll is a threat to democracy. Every vote counts. My colleague C.P. Joshi lost an election by just one vote,” said AICC general secretary Ashok Gehlot. 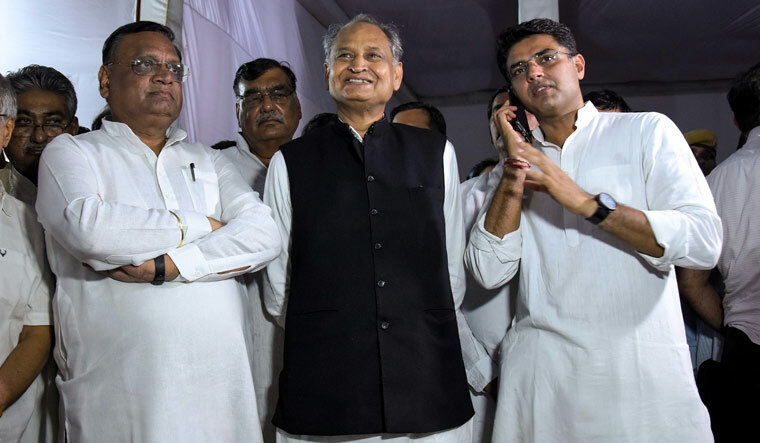 The former Rajasthan chief minister claimed that the present state government is meddling with the voters' list in an organised manner. “Fake voter IDs hit at the very foundation of a republic. Democracy rests on the authenticity of electoral roll. The Election Commission should swiftly get into action and satisfy the questions that have been raised by the Congress,” said Rajasthan PCC president Sachin Pilot.